Removing dew claws is considered cruel and barbaric by some, and a necessary evil by others. Dog dew claws are often removed for cosmetic reasons, but very often it is to avoid painful injury in the long run. Lets take a look at the pros and cons of dew claw removal, and what dew claw surgery involves. Dew claws are commonly found on the inside of a dog’s front paw, and occasionally on the back paws too. They are situated higher up the paw than the rest of the claws, and don’t touch the ground. While vets frequently remove dew claws from puppies under local anesthetic or sedation when the pups are only a few days old, can a vet remove dew claws in older dogs; what does it involve; and is it wise to do this? The answer is yes, but first, one needs to differentiate between removing dew claws, and trimming dog nails. The dew claw is actually a digit rather than just a claw, and the removal of dew claws is thus far more complex and painful than simply trimming the dog’s nails, which does not cause the dog any pain at all. 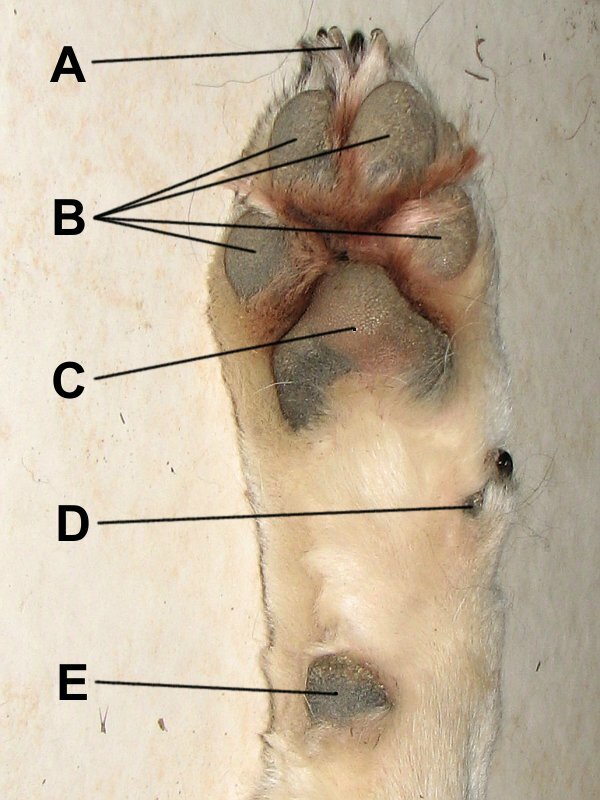 As the whole toe is removed, the procedure only has to be performed once, whereas trimming dog nails – including trimming of dew claws – should be done regularly as part of the dog’s general grooming routine. Dew claws are frequently removed by breeders when the puppies are between two and five days old. This is often done to conform with breed standards, and consequently, dew claw removal is quite a controversial issue, for as with tail docking, many believe that the dog should be left unaltered as painful dew claw surgery is unnecessary, and is purely conducted for cosmetic reasons. While this may be true in some cases, there are those that believe that the dew claw serves no purpose, and they can potentially cause the dog much pain if they should get hooked on a rug, or snagged in a thicket of bush while romping outdoors. Most of the time, dew claws can be left intact without causing your dog any woes, but sometimes it may be in the dog’s best interests to have a vet remove the dew claws. Almost all dogs have dew claws on the front feet, and in most cases, these don’t cause the dog any grief. Dew claws on the front paws are used for gripping items, such as bones, while they chew. Dew claws on the rear paws occur much less frequently on dogs, and often dangle loosely, where they have the potential to get hooked on furniture, carpeting, or bushes, and can cause the dog an excruciatingly painful injury. Furthermore, because dew claws are positioned higher up the paw, these nails do not wear down, which can lead to the nails on the dew claws curling round and penetrating into the pad on the underside of the paw. This can cause your pet further pain and distress if it is not noticed and attended to in time. The number of dew claws that you need to have removed will affect the cost of dew claw surgery, as will the complexity of the operation, which will be affected by how much muscle and bone is attached to the claw. Dew claw removal is much simpler in puppies as the bones are still soft, and muscle tissue has not developed. As the anesthetic is often the most expensive part of any surgery, you will save costs if you have this procedure done while your dog is under general anesthetic for other surgery, such as spaying or neutering. It is best to call your vet to get a quote, and it won’t hurt to get more than one quote as prices do vary between veterinary practices. The following steps outline the procedure for surgically removing dew claws in dogs. When removing dew claws from adult dogs, the procedure is carried out under general anesthetic. The vet will initially administer a pre-anesthetic sedative to calm the dog, followed by an intravenous anesthetic, which will enable him to place a breathing tube down the dog’s throat. The dog will then inhale oxygen combined with anesthetic in gas form through the breathing tube to keep him unconscious throughout the operation. In puppies under five days of age, a general anesthetic is not used for dew claw removal, but rather a local anesthetic is given, or the pup may be sedated. The skin surrounding the dew claw is disinfected by washing with surgical soap to prevent infection. Using surgical scissors, the vet will quickly cut through the skin, muscle, and bone, to remove the entire toe. Once the dew claw is removed, the wound is stitched up with either dissolving or non-dissolving sutures, or surgical adhesive may be used in the case of young puppies. In older dogs the wound is covered with a bandage, which will need to be kept on until the wound starts to heal. As dogs tend to readily lick and bite their paws, it may be necessary to fit the dog with an Elizabethan collar if it constantly interferes with the wound. Dew claw surgery typically takes between 15-30 minutes to complete, and the dog can return home within 2-3 hours, once the anesthetic has worn off. The wound must then be checked daily for any sign of infection such as redness, puffiness, or obvious distress to the dog. If non-dissolving sutures are used to stitch the wound, they will need to be removed in five to seven days time, whereas dissolving stitches are absorbed and need not be removed by the vet. Removing Dog Dew Claws: Final Verdict? The subject of removing dog dew claws is filled with controversy, but at the end of the day, it is a decision that can only be taken by a dog breeder, or a dog owner who is responsible for the welfare of the dog under their care. However, if you own a dog that did not have its dew claws removed when it was a wee pup, and they are not causing your dog any distress, or pose any risk of injury, it is probably wiser to leave well alone rather than to subject your pet to expensive dew claw surgery that will cause the dog a certain amount of pain.